Biology. The child learned characteristics of birds and how they are different from mammals, reptiles, fish, insects, and amphibians. He further refined his knowledge by learning the distinguishing features of differing bird orders and species. He learned about birds’ life cycles and habitat requirements. He learned about the relationship of birds to dinosaurs. Environmental science. The child learned about ecology through studying bird habitat. He learned about birds’ sensitivities to environmental degradation, and how humans can provide and protect appropriate habitats. Library science. The child got an introduction to the classification of materials in the library, such as the basics of the Dewey Decimal system. History. The child learned about humans’ interest in flight and the invention of the airplane. He learned about the World Wars through the lens of the homing pigeons’ role in carrying messages. Literature. The child read and appreciated short stories and poetry about birds, and reinforced his understanding of the literature with his own writing. The list goes on. Depending on the parents’ facilitation and the direction of the child’s interests, a months-long or years-long bird study can also encompass physics, art, genetics, dance, math, social studies and more. Propelled by genuine interest, the child will practice academic skills and build a scaffolding of knowledge and culture that will provide hooks for other subject area content through the connections the child can make. But that’s not the most important thing that’s happened during this interest-based learning scenario. The important thing that’s been developed is metacognition — the child has been learning about his own learning. Enhancement of metacognition is the real harvest of a Tool of Engagement like interest-based learning — and we’ll explore that in a future post. 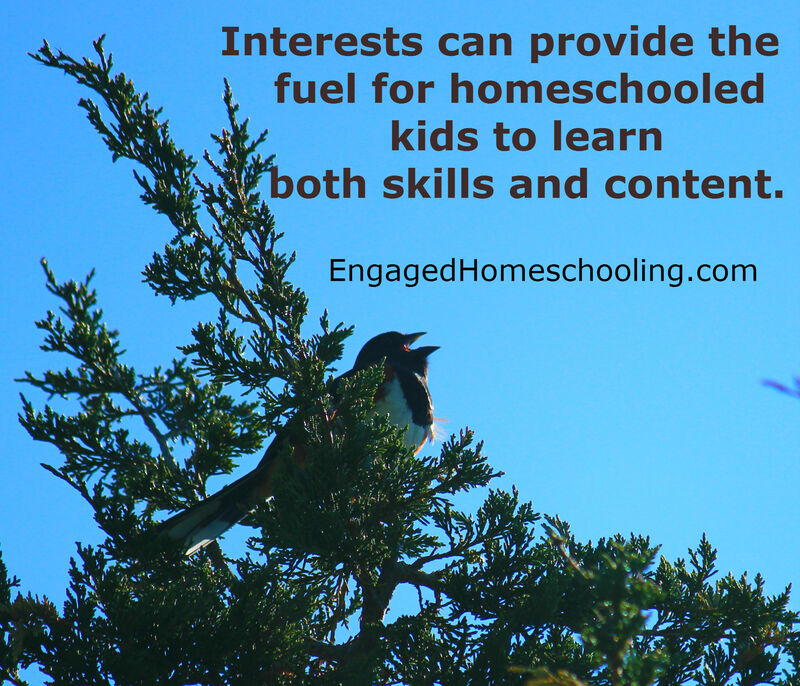 You might also enjoy my previous post on this topic, “Interests Create Engagement,” which includes reference to the latest academic research about the power of interest-based learning.